One of the two robotic-welding cells operating at K-zell Metals—the company gained a full return on its automation investment within two years. Custom contract manufacturers must be prepared for any job that comes through the door—no matter how comtplex or challenging. Don Kammerzell, owner of K-zell Metals, Inc., Phoenix, AZ, knows that firsthand. “We do the jobs that nobody else wants to do…or can’t,” Kammerzell says. “Everyone in the area knows that they can rely on us to work with almost any material and on almost any design.” Among the firm’s unique projects: fabricating horse-race starting gates, constructing limited-edition silicon-bronze playground sculptures and supplying components for military vehicles. 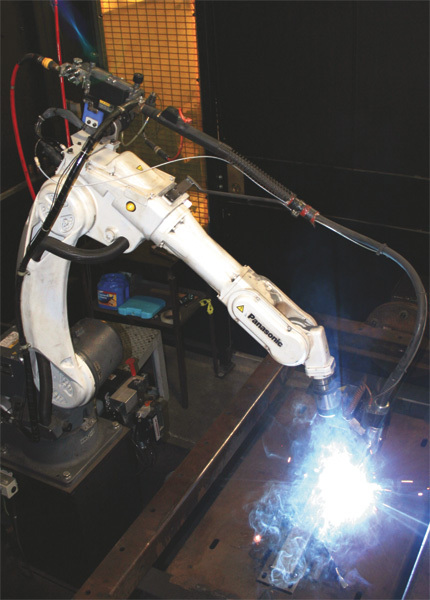 In addition to custom-forming, laser-cutting and CNC press-brake equipment, K-zell Metals also operates a pair of robotic arc-welding cells that allow the company to create precise assemblies and maintain a competitive edge, compared to the days when it relied solely on semiautomatic arc welding. According to Kammerzell, the robotic-welding cells have allowed the company to significantly increase throughput. It can produce as many as 5000 parts in a single run, while maintaining the same overhead. K-zell outfitted each robotic-welding system with a hybrid air- and water-cooled robotic gas-metal-arc-welding (GMAW) gun, the Tregaskiss Tough Gun I.C.E (Integrated Cooling Enhancer). The hybrid design allows water circulation to the nozzle, keeping the front-end consumables running cooler and lasting longer. The design, says Kammerzell, allows K-zell Metals to easily switch from welding thick and thin parts without the hassle or downtime of changing out the entire gun. The hybrid gas-metal-arc-welding gun combines the durability of an air-cooled gun with the cooling features of a water-cooled one. The external water lines circulate coolant to the front-end consumables, helping them run cooler and last longer when welding heavier gauge work. Given that K-zell welds on such a variety of parts, materials and thicknesses, Kammerzell, along with the company’s robotic-welding supervisor and quality-assurance manager Jim Benjamin, sought one robotic GMAW gun that could accommodate it all—the Tough Gun I.C.E. The hybrid gun features stainless-steel water lines that run along the outside of the gun’s gooseneck down to the nozzle, rather than through the gooseneck like traditional water-cooled guns. The design provides water circulation that keeps the consumables running cool, and it simplifies maintenance. When welding thicker parts (1⁄4 in. or so), Benjamin explains, the weld-cell operator connects the I.C.E. gooseneck to an external water cooler within the cell. The addition of the water cooling allows the company to weld at the higher amperages required when welding thicker parts, or when welding for prolonged periods of time. 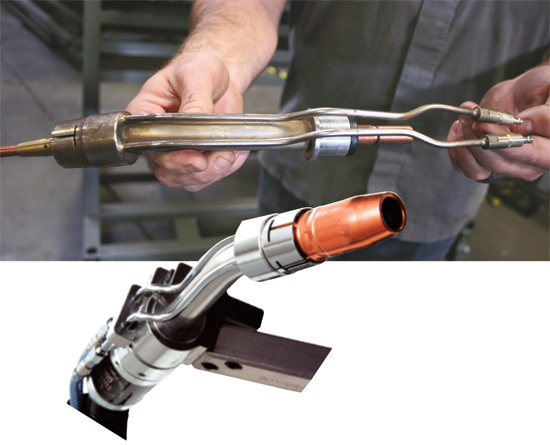 When welding thinner parts (16 to 10 gauge typically), the operator changes over to an air-cooled gooseneck. When Kammerzell and his team decided to invest in robotic welding, the goal was to gain a 15- to 20-percent increase in productivity and reduce costs—for its customers and for themselves. It’s exceeded those goals, while also focusing on delivering precise, repeatable parts to the welding cells. This was a really fascinating read, it just blows me away that technology has come this far in terms of production. It definitely seems like a robotic welder would have a huge advantage over human workers since there isn't as large of a margin of error. If programmed correctly they could also probably work at much higher speeds than their human counterparts as well.